The world is still reeling from the sudden and shocking death of comic genius Robin Williams. It is a shame that a man who brought so much joy to so many found himself in such a dark place in the end. I never had the pleasure of meeting the funnyman, but several of my fan-girl friends did and all said he was incredibly generous and kind to those he encountered, never turning down a picture or an autograph request. Over the years I have visited several locations from the more than 100 productions the comedian took part in during the course of his career. My favorite Robin Williams-related filming locale is the turreted home at 2640 Steiner Street in San Francisco, where the Hillard family lives in Mrs. Doubtfire. 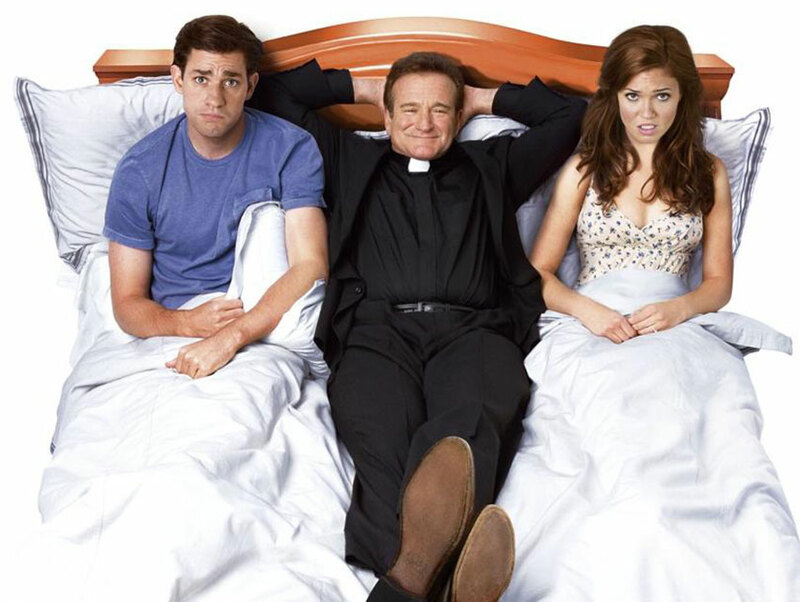 A spot closer to home, though, is Joe Jost’s bar in Long Beach, where, as Reverend Frank, Williams holds pre-marriage counseling sessions for Mandy Moore and John Krasinski’s characters in License to Wed. The historic tavern, which is the city’s oldest surviving bar, looks a bit different in person than it does onscreen. While the real-life façade of the watering hole was used in the movie, it was made to appear as if it was situated on the ground floor of a high-rise building in Chicago (with a little help from CGI). 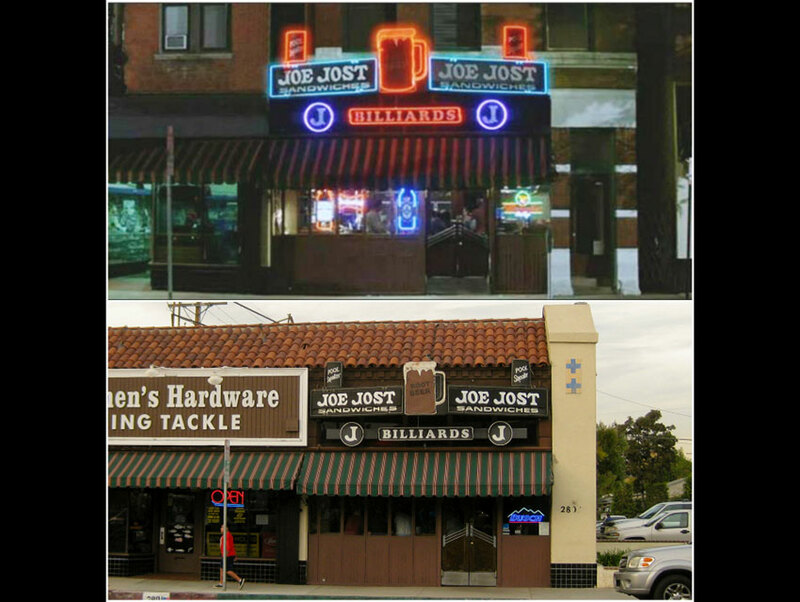 In actuality, Joe Jost’s is located in a one-story standalone structure at 2803 East Anaheim Street in the LBC. The bar was established by a Yugoslavian native named Joe Jost in 1924 and originally served as a combination pool hall/barber shop/sundries store. When prohibition ended in 1933, Jost’s began serving alcohol. The Barbering Commission stepped in shortly thereafter, informing Joe that cutting hair in close proximity to alcohol was unsafe. Out went the barber shop chairs and in came booths and tables to accommodate more bar patrons. Today Joe Jost’s is a Long Beach landmark. You’d be hard-pressed to walk around the city without seeing someone donning one of the establishment’s famed navy blue T-shirts. The saloon has also attracted its fair share of location managers. Besides License to Wed, the tavern is where Josh Duhamel plays darts with Kate Bosworth and Topher Grace in Win a Date with Tad Hamilton, where Kevin Costner dances with Whitney Houston (another legend whose life ended far too soon) in The Bodyguard, and where Angelina Jolie tends bar in Gone in Sixty Seconds. I hope Robin Williams has found some sort of peace in death. He leaves behind an incredible legacy, not only of the countless iconic film and television characters he created, but also the sentiment that people should be a little kinder to each other. You never know what untold battle the stranger next to you may be fighting. Photos: A screen capture from License to Wed (top) and a photograph of the location taken in January 2010, courtesy of Lindsay Blake.